I thoroughly enjoyed watching "The Sultan's Elephant" at the weekend, and if about 4000 photos so fat on Flickr are anything to go by, then I'm not the only one. Here are mine by the way. 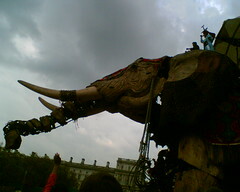 This is a piece of street theatre, with massive puppets parading through the streets of London over four days (4th - 7th May 2006). It's an ambitious work, which took years to build and plan, and was a resounding success. I cycled over to The Mall on Friday evening to see it after work, and caught a glimpse as the Sultan went in to attend a private party in Pall Mall (that description from the official timetable). On Sunday I took the family up for another look. We saw the little girl riding her scooter, and then getting into the rocket and disappearing. It was very crowded, and a great spectacle. We also of course saw the eleven metre high elephant spraying a happy crowd with water. I love London for stuff like this.